Like many surviving works of medieval art, these gable-shaped reliquaries are the product of a number of medieval and modern alterations. The repoussé panel showing Christ treading on the lion and the serpent was originally part of an eleventh- or early twelfth-century work, perhaps a reliquary or an altar frontal. 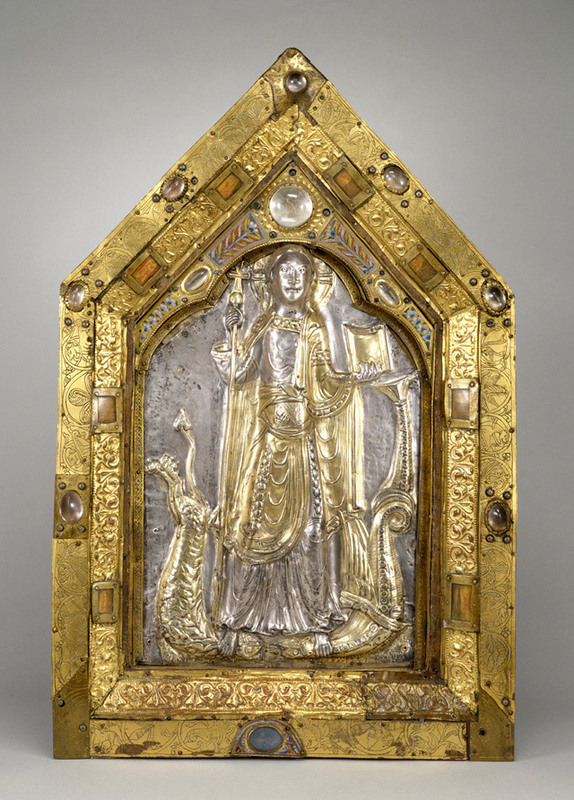 Later in the twelfth century, this panel was probably reused on a gabled reliquary chasse made for St. Oda of Amay, in present-day Belgium, with St. Oda herself shown on another panel from that shrine. 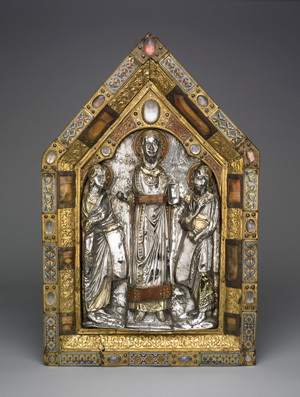 In the thirteenth century, when a new shrine was made for St. Oda, these two panels from the older shrine were preserved and modified to serve as reliquaries in their own right, with small cavities for relics added to the frames. These small cavities were covered with pieces of translucent horn, allowing the relics inside to be seen, and their contents were labeled with small pieces of parchment. The two reliquaries were kept together as a pair until the turn of the twentieth century, when the panel with Christ, which had been repaired in the nineteenth century, was sold to Henry Walters, and the reliquary depicting St. Oda was sold to Sir Julius Wernher, eventually entering the collection of the British Museum. The depiction of Christ trampling beasts is taken from Psalm 91(90):13: "You will tread on the asp and basilisk, the young lion and the serpent you will trample underfoot." Christ's triumph over death was depicted on many shrines and altar frontals in the Middle Ages, and the image would have been appropriate for the cult of any saint, as saints were understood to enter heaven immediately upon dying, thus conquering death in the manner of Christ. The Oda panel shows the saint herself flanked by female figures personifying religion and alms-giving, notable characteristics of the pious widow Oda.